Chelsea manager Maurizio Sarri was absolutely furious on the touchline as Kepa Arrizabalaga refused to be substituted off against Manchester City. The Spanish goalkeeper did not initially look fit enough to stay on the pitch, with Willy Caballero all prepared to come on in his place. 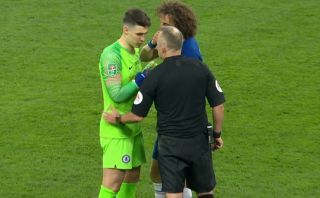 However, Kepa seemed to decide he was fine and point-blank refused to come off, with Sarri eventually deciding against making the substitution. The Italian tactician was then, however, absolutely livid on the touch line and nearly stormed off altogether.